'C' Coy, 1/4th Bn, The Royal Sussex Regiment, 160th Brigade, 53rd Division, T.F., M.E.F. 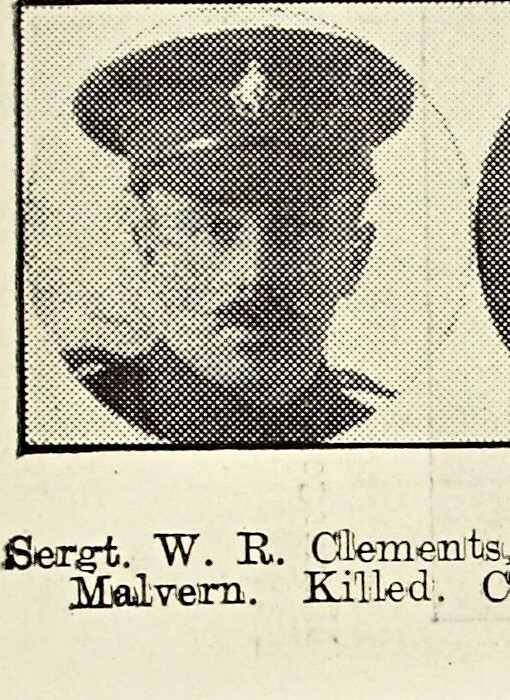 William Clements was born at Bransford in 1879, the elder son of William and Emily Clements. He served his apprenticeship at Norman May’s Photographers in Malvern and later moved to Sussex where he joined the GPO Telegraphs Department, South Coast District. In 1911 he was living with his in-laws at the General Abercrombie Inn at Arundel, having married Sarah Slaughter the year before. At this time their first born daughter, Evelyn was three months old. William joined the 1/4th Royal Sussex Regiment, whose headquarters were at Horsham, but ‘C’ Company in which he served was probably based at Arundel. He landed at Suvla Bay on the 9th August 1915 and moved to Egypt with the rest of the Battalion in December. He was killed in action at Gaza on the 19th April 1917. He left a widow and one child.